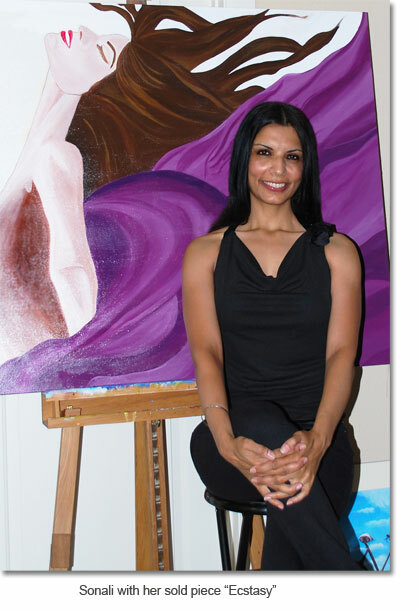 Sonali is a multiple international award winning contemporary artist. You can find her paintings on Rachel Ray and Better Homes and Gardens. She has been written about and featured in various magazines. She has been invited to talk about art on local Austin community radio. She also writes blogs to promote the power of art in the healing process of mind and body motivating others by her own personal experiences. She has exhibited internationally and her artworks are in private collections around the world. She also auctions her paintings at local fundraisers. Being a free-spirited artist, her body of work is diverse - from representational to abstract. Her paintings are profoundly imbued with emotional content that she articulates through a range of styles. Her expressions are strong, bold and compelling. Cultural expectations and struggle take a center stage in her works. Her subjects are real, and whether happy or sad, she paints it in her own personal style. The unique part about her is that she ends her artwork with an inspirational note as she believes that it's not what the situations are but how they are dealt with. She mainly works on canvas with oil and acrylic paints. Palette knife and barbecue skewer are her favorite tools. Some of her paintings are inspired by Picasso because of her liking for his cubism style that gives depth to the work. Also, Georgia O’Keeffe because not only was she a bold personality, but she found her ability to isolate one aspect of a subject and blow it up large scale on canvas quite appealing. She had the fortune of traveling around the world, had opportunities to get international exposure. What started as a part time hobby has now become a full time profession. A portion of her sales are going to an Old age home in Patiala, India. Born and raised in India, she currently lives in Palm Beach Gardens, Florida. Read more about her journey . . . how art came to her rescue . . .
MISSION : I transform your space into stylish and elegant with my artwork. My artwork influence and empower you with positive energy. I convey powerful messages that make you think; make you look within your soul to see what the magical world of art, says to you. Art should move your body and soul into a positive light . . . and not just hang on the wall. My mission is to assist clients in developing collections that have deep personal meaning and empower them with my positive vibes. I offer my consultancy to help people figure out the right piece of art for the right setting or space. Many times, it is not easy for people to visualize how a certain painting would look like on a wall. The décor style is an extension of yourself and communicates so much about your personality. INSPIRATION: This is a beautiful world. I may find inspiration anywhere I look. My art is an expression of the psychological and emotional interpretation of events. My psychologist mind desires to study people that inspires me to paint human forms. It evokes different emotions, but I do not hold back on my creativity. I express my own thoughts on any issue or any subject, without expectations or cultural restraints. GOAL: My intent is to make my art conversational and serene. I feel, even if a drop of inspiration or encouragement becomes a reservoir of confidence and creativity in someone's life, it would be worth it. And that is how “Serene Compositions”- my brand name came into existence. It makes me incredibly happy to see my clients, art collectors, fans inspired and happy. My art is a true reflection of who I am. I am in a constant state of gratefulness to God who has taken me to where I am and to where I am headed. Copyright©soni126 Inc.2012. All Rights Reserved.